Finding this record of an 1802 birth was the key. In an average family situation, you grow up with your biological mother and father and know many of their relatives. That doesn't describe everyone—I know. But stick with me for a moment. If your DNA match list includes 1st and 2nd cousins, you should know who they are. If it includes 3rd cousins, you may be familiar with their names or know who their grandparents were. I've met a couple of 3rd cousins this way, and they helped me fill in their parts of my tree. It's that 4th to 8th cousin DNA match that presents the real challenge. If you're 4th cousins, you share a set of 3rd great grandparents. And who (besides a genealogist) can name their 3rd great grandparents? The most productive DNA match to collaborate with is likely the one with familiar last names in their family tree. And if your match has a family tree online, they've probably done some worthwhile research. It's OK if you're concerned about your privacy. You don't need to share the identities of anyone younger than your great grandparents. Go ahead and show one another what you've found—focusing on a branch where you think you'll find a connection. Together you can advance one another's work. How will you know which branch to look at? Last names and hometowns could be your clue. Or you may start out with no clue at all! I'm incredibly lucky that all my ancestors come from a single province in Southern Italy. (One exception: My great great grandmother Colomba came from the neighboring province.) Better still, the vital records from my five ancestral hometowns are available online. On Sunday one of my DNA matches reached out to me. Each of our last names comes from the same little town in Italy. We found one another years ago, but we've never found our actual family connection. When your tree is really big, there are tons of avenues to explore. So I'd never gotten around to exploring her family tree on Ancestry. Then she asked for my collaboration in the best possible way. She said, "Here's my ancestor, and his mother Maria had your last name. I know her father was Pietro and her grandfather was Francesco. I think her grandfather could be this Francesco in your tree. What do you think?" Not only was that enticing, but her question showed me exactly where to jump in and start exploring. This tree connects me to my DNA match...sort of. She and I both realized that if my Francesco was the same man as her Francesco, he had to have been married twice. That's because I have his 1820 marriage record, and Pietro was born well before that. So I searched for evidence. 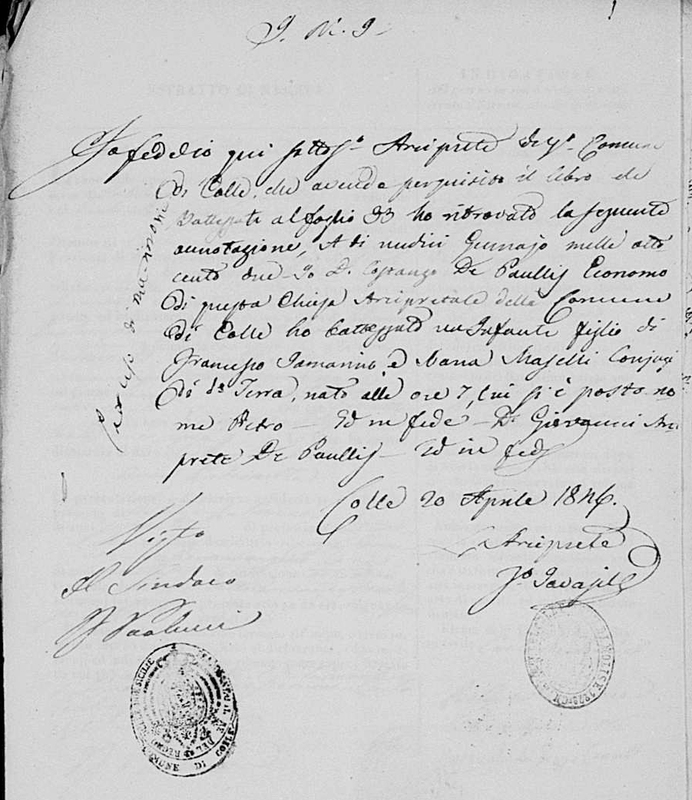 Francesco's 1820 marriage documents mentioned no first wife. I needed his son Pietro's birth record so I could see his mother's name. 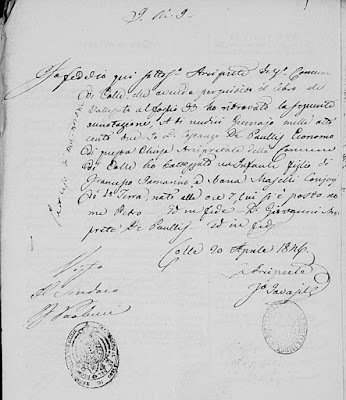 But Pietro was born before the start of civil record-keeping in 1809. I approached the problem from the other side. I should be able to find a copy of Pietro's birth record in his marriage documents. But I didn't know when he got married. How would you try to figure out when he got married? I took another look at his daughter Maria. I found her birth record in 1855 and saw her mother's full name. I went backwards, year by year, looking for Maria older siblings. This helped me zero in on her parents' marriage. Now I had Pietro's mother's name. 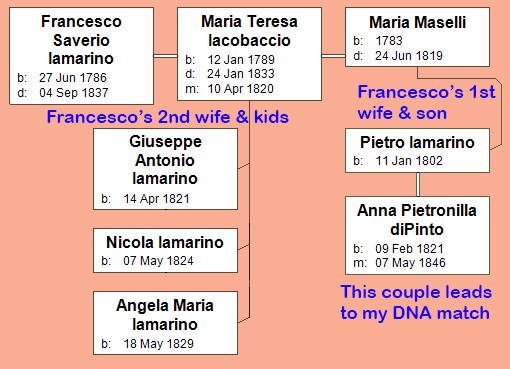 I confirmed that she died shortly before Francesco remarried in 1820. My Francesco and my DNA match's Francesco were in fact the same man. Here's the kicker, though. It's Francesco's second wife who's my blood relative. Not Francesco or Pietro or Maria. So, my dear DNA match, we still haven't found our real connection! It's back to work, but now we have more to work with. On the plus side, my DNA match has the same last name as my first cousin. And I've learned a lot from my match's tree that could help me with my cousin's tree. So pick out your most intriguing DNA match and reach out to them. Collaboration may get you both further than you'd ever have gotten on your own.